A petition against removing an all-weather lifeboat in New Quay, Ceredigion, has reached 10,000 signatures. It is due to have its Mersey class all-weather lifeboat replaced with a much smaller inshore one, costing £214,000. Campaigners have said it would leave a 70-mile gap, without any all-weather provision across Ceredigion. 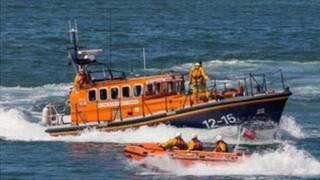 The RNLI said the decision was the result of a five-year coast review. Campaign chairman Richard Taylor said it was a "poorly considered decision that cannot go unchallenged". New Quay town councillor and lifeboat crew member Huw Williams said the gap in cover would be "dangerous" and the New Quay lifeboat had carried out many rescues over the last 10 years that the new lifeboat would not be capable of doing. "The nearest all-weather boats based at Barmouth and Fishguard would take up to an hour and a half to respond to an emergency in the New Quay and Aberaeron areas," he added. The RNLI said the new lifeboats would allow volunteer crews to "respond quicker and travel further to help those in trouble at sea". Pwllheli and Barmouth stations in Gwynedd are each getting the charity's "most agile and manoeuvrable" Shannon class all-weather lifeboat at a total cost of £4.4m.